The Location Services capabilities of iPhone and iPad allow the devices to use onboard GPS, Wi-Fi, cell tower location data, and Bluetooth to determine the location of the iPhone or iPad. With iPhone, this location data can be pretty much exact, placing the location of the iPhone (and potentially you) perfectly on a map thanks to GPS and cell tower triangulation, and it’s impressively accurate with iPad too. Many iOS apps rely on location data to function properly, for example the various map applications rely on device location data to be able to accurately route directions to and from destinations, you can easily share your current location with someone through Messages, and weather apps use location data to gather location relevant weather data. But not everyone is thrilled with their location being used by apps or the iOS operating system, and some users in high security or privacy-important environments may wish to completely disable Location Services on their iPhone or iPad. This article will show you how to disable all Location Services on an iPhone or iPad, preventing geographic location data from being gathered or used by all apps and most iOS services too. Remember, turning off Location Services completely will prevent any app from being able to use your geographic location or location data. That includes apps that require geolocation to function properly, like Maps. You can also choose to disable Location Services on a per-app basis, which is a great targeted approach if you’d rather keep the Location Services feature on broadly, for things like maps and directions, but still want to strictly limit which apps and system services are able to use, access, and retrieve your location data. Most iPhone and iPad users should probably follow this approach, and leave the feature enabled while instead selectively turning off location data for the majority of apps. This is done through the same Location Services section of Privacy settings, but you must choose each app specifically in the list to customize, selecting “Never” to disable location services for the apps in question. My personal opinion (in case you wanted my specific thoughts on this topic) is to leave Location Services enabled in iOS, but to very strictly limit what apps and services are able to use your location data. Frankly, the vast majority of apps do not need your location data, and they should not have access to it. My opinion is that some apps make sense to use your location data, including apps like Maps, Google Maps, Find My iPhone, Find My Friends, Compass, Waze, Weather, maybe even apps like Calendar and Reminders if you just location aware features in those. But that’s about it. Anything else almost certainly doesn’t need your location data to function, but if you aren’t sure, just think about how the app is used… is location required to get the usage you desire out of a particular app? The answer is probably obvious, and also probably a no. Does a camera app need your location in order to function? Nope, turn it off. Does social media need your location data to function? Nope, turn that off too. Does a language learning app need your location? Nope. Does a maps app that uses your current location to route you accurately to a destination need your location? Yes. Just use a little common sense. Why Disable Geographic Location Services on an iPhone or iPad? 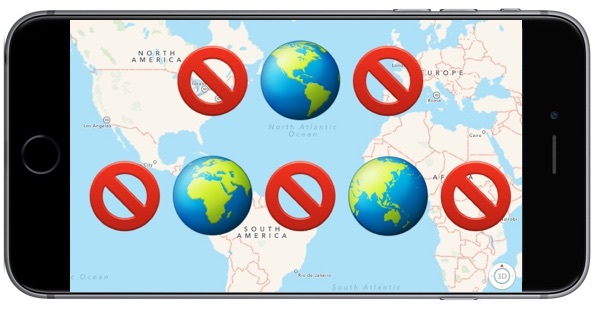 There are many possible reasons to disable geographic location services on an iPhone or iPad, but the most commonly cited reasons to disable location data come down to security and/or privacy. Security: If you’re using an iPhone or iPad in a high security environment, you may want to disable location services to protect the location. In fact, depending on your job and where you live, you may even be required to disable location services on a device, as is the case now with many personnel employed by government and military. Privacy: If you’re using an iPhone or iPad at a location that you’d rather keep private, perhaps your personal home address, an office, school, shelter, a favorite swim hole, or some other beautiful place that you’d rather not be discovered, overused, and ruined, then disabling geolocation and geotagging on iPhone camera, disabling geolocation and location services for all social media apps, removing location from photos, stripping geotags and geolocation and other metadata from pictures, and anything similar is a great idea. Battery life: The other reason that many iPhone and iPad users choose to disable location services – though usually only on a per-app basis – is to improve device battery life. Using GPS and location data requires more power, and thus if an app is using a lot of location data, it can reduce the battery life of an iOS device. If you’re interested in this particular concept, we’ve discussed before here how you can find what apps are using location services in iOS, which can also help to mitigate battery drain on iPhone and iPad. Location Services allows Apple and third-party apps and websites to gather and use information based on the current location of your iPhone or Apple Watch to provide a variety of location-based services. For example, an app might use your location data and location search query to help you find nearby coffee shops or theaters, or your device may set its time zone automatically based on your current location. To use features such as these, you must enable Location Services on your iPhone and give your permission to each app or website before it can use your location data. Apps may request limited access to your location data (only when you are using the app) or full access (even when you are not using the app). For safety purposes, however, your iPhone’s location information may be used when you place an emergency call to aid response efforts regardless of whether you enable Location Services. Traffic. If you are physically moving (for example, traveling in a car), your iPhone will periodically send GPS locations and travel speed information in an anonymous and encrypted form to Apple, to be used for augmenting a crowd-sourced road traffic database. Popular Near Me. Your iPhone will periodically send locations of where, and when, you have purchased or used Apps in an anonymous and encrypted form to Apple, to improve a crowd-sourced database that may be used to offer geographically-relevant Apps and other Apple products and services. Significant Locations. Your iPhone will keep track of places you have recently been, as well as how often and when you visited them, in order to learn places that are significant to you. This data is transmitted end-to-end encrypted between your iCloud connected devices and will not be shared without your consent. It will be used to provide you with personalized services, such as predictive traffic routing, and to build better Photos Memories. Location-Based Apple Ads. Your iPhone will send your location, including its travel speed and direction, to Apple in order to provide you with geographically relevant iAds. Location-Based Suggestions. The location of your iPhone will be sent to Apple to provide more relevant recommendations. If you turn off Location Services for Location-based Suggestions, your precise location will not be sent to Apple. To deliver relevant search suggestions and news, Apple may use the IP address of your internet connection to approximate your location by matching it to a geographic region. Location-Based Alerts. Your iPhone and Apple Watch will use your location in order to provide you with geographically-relevant alerts, such as a reminder to call someone when you get to a specific place, when to leave for your next appointment, or an app recommendation based on where you currently are. HomeKit. Your iPhone will use your location to enable accessories to turn on or off when you arrive or leave a specific location, such as turning on your lights when you get home. You may choose to disable Location Services at any time. To do so, open Settings on your iPhone, tap Privacy, tap Location Services, and either turn off the global Location Services switch or turn off the individual location switch of each location-aware app or feature by setting it to “Never”. To disable Location Services for all websites, set the Location Services setting for Safari to “Never”. You may also disable location-based system services by tapping on System Services and turning off the switch for each location-based system service. Ultimately it’s up to you as a user (and perhaps your employer) how you use Location Services in iOS and whether or not you want certain apps, all apps, or as little as possible using your geographic location data. And for Mac users, you’re not left out either, though the process is obviously going to be different you can disable Location Services on a Mac too if desired. Interesting topic. And though I don’t turn it all off, I agree that strictly limiting location data is critical in todays world. 2) Anytime when you update iOS, go check Location Services settings again. I have noticed that updating to iOS 12 enabled a lot of system service location settings that I had previously disabled. I don’t know if that’s a bug or if it’s intentional, but I went ahead and turned all those Location Services off again. I personally NEVER allow any apps to access my location data, with exceptions for Google Maps, Waze, and sometimes Apple Maps, because I use those for traffic and driving. I also only allow location use when those apps are actively being used only. There is no other app that needs your location, period. In my opinion everything else is surveillance and snooping on what YOU are doing in real life by tracking YOUR location. No thank you! Sharing your location into the world is asking for trouble. It’s a huge invasion of privacy, it’s a huge security risk, it’s also problematic for anything discrete. Think about what it means to be tracked geographically, all the time, by your phone or electronic device? And people opt-in to this why? Are they crazy? Think about where you use your iPhone, iPad, or computer. They are intimate spaces, like your home residence, your office, your school, your job, your favorite park, your favorite restaurant, your favorite beach, your vacation, a friends house, a relatives house, a doctors office, a hospital, a store…. why should you share these locations with an app? Why would you share those locations with anything or anyone? This is tracking you, it is surveillance at a vast scale through social media, and it could be accessed by anything that wants to tap into that location data bad enough through hacking, force, or whatever other means. The best solution is to not offer the data in the first place! And what do these apps and companies do with your location data anyway? Sell it? Mine it? Advertise it? Gather it to form a map of what you do and where you go? Share it with everyone in the world to find? Do we have any idea? No thanks. If you think turning this off gives you any level of security, you’re wrong. Even fully powered off your phone emits a signal that can be tracked. Basically turning off geolocation may prevent some third party apps from seeing your location, but Apple will know where you are, your cell company will always know where you are, and every GPS satellite knows where you are to pinpoint precision. Or, skip cell phone ownership entirely. And don’t get a car with GPS or any onboard electronic features. And no computers, nothing with a microphone, no smart TV, no electronics. And wear a tin foil hat! Hehe! That’s tongue-in-cheek of course… partially… heheh. But, anyone actually interested in this stuff should leave their important electronics at home and then visit the annual #DEFCON conference in Las Vegas…. it will open your eyes to the darker world of electronics, hacking, and surveillance in ways you never imagined possible! Apple needs to add Location Settings as an option in the Control Center. Of the people I know, this is one of the most used options (on/off) and it’s simply annoying to navigate for this simple purpose. Could not agree more. Hands down the preference that gets turned on and off the most here. Fun times with the little digital trackers we all own and carry with us everywhere!